After a quarter of a century in research science, sticking with the facts, the biggest kick I get from writing fiction is the freedom it gives me to invent, to make stuff up (to lie?). I love working at the interface, too – the space where fact and fiction blend or join or mix, or where you can’t quite tell which is which. So, in the final week of my month as FAWWA CAL Established Writer in Residence, join me for a workshop about making stuff up. When writing fiction, Tracy Farr likes to take the truth and – taking her cue from Emily Dickinson – tell it slant. In this workshop we’ll look at how, as writers, we might take elements of fact and twist them (by telling them slant, or making them strange) into fiction. We’ll celebrate the playful, puzzle-like process of meshing together facts that at first might seem disparate and disconnected, and making them belong together. This half-day workshop is suitable for aspiring or experienced writers of fiction (and has some application to memoir and non-fiction). Bookings and enquiries: Contact FAWWA admin.fawwa@iinet.net.au or (08) 9384 4771. Find details on the FAWWA events calendar. I’m doing another workshop at FAWWA in September, State of Origin — details here. In an interview with RTR FM Artbeat, I talked about the two workshops I’m teaching at FAWWA — have a listen. 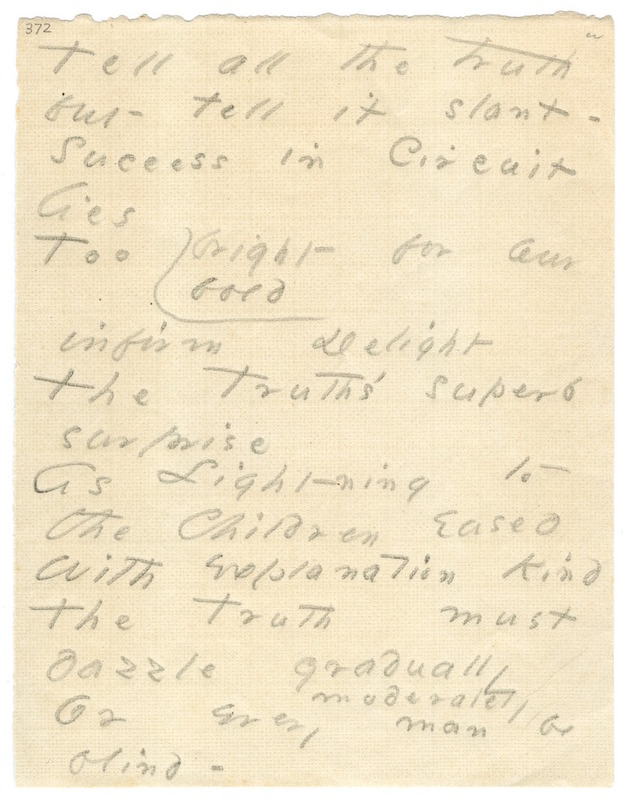 Image: ‘Tell all the truth but tell it slant’ by Emily Dickinson, Amherst Manuscript # 372, sourced from Amherst College Digital Collections>Emily Dickinson Collection.